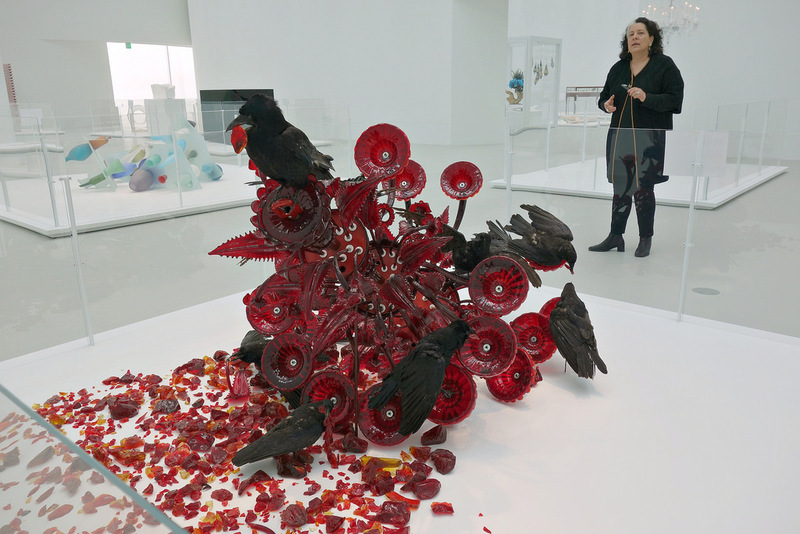 CORNING, NY — This Friday, a luminous new wing of the Corning Museum of Glass opens for the display of contemporary glass art and its molten creation. 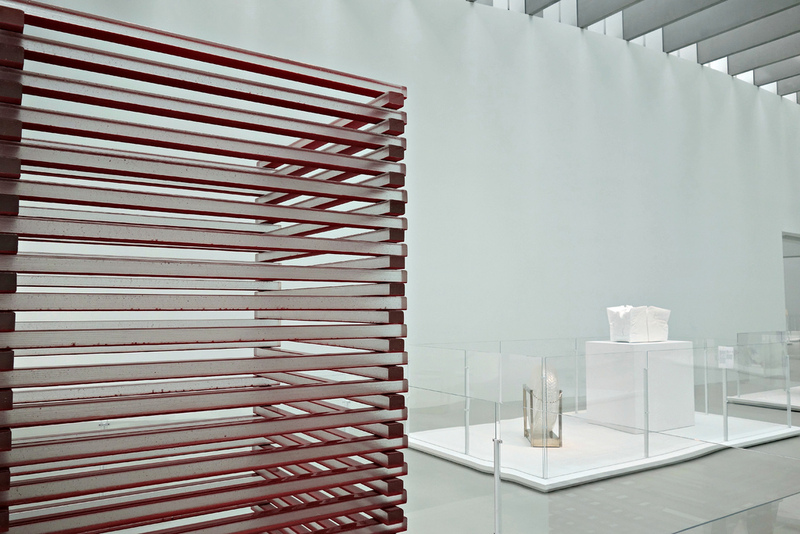 At 100,000 square feet, the Contemporary Art + Design Wing in the Corning, New York, museum is the world’s largest space designed for contemporary glass. 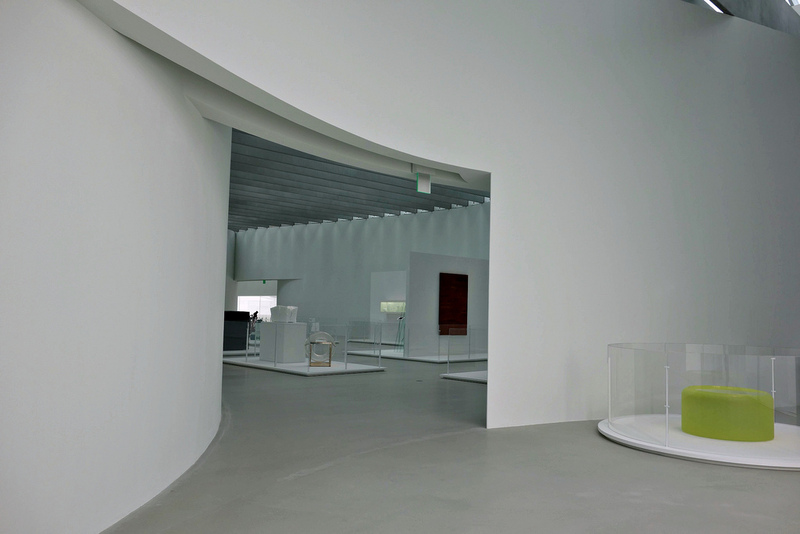 Thomas Phifer and Partners structured the galleries around the dispersal of natural light, which filters down through a full roof of skylights and into the sides of the box-shaped building with huge windows. 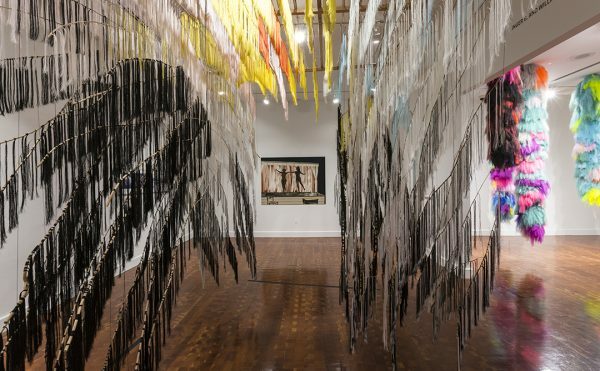 The inaugural exhibition features 117 works from the permanent collection dating from 1990 to present. 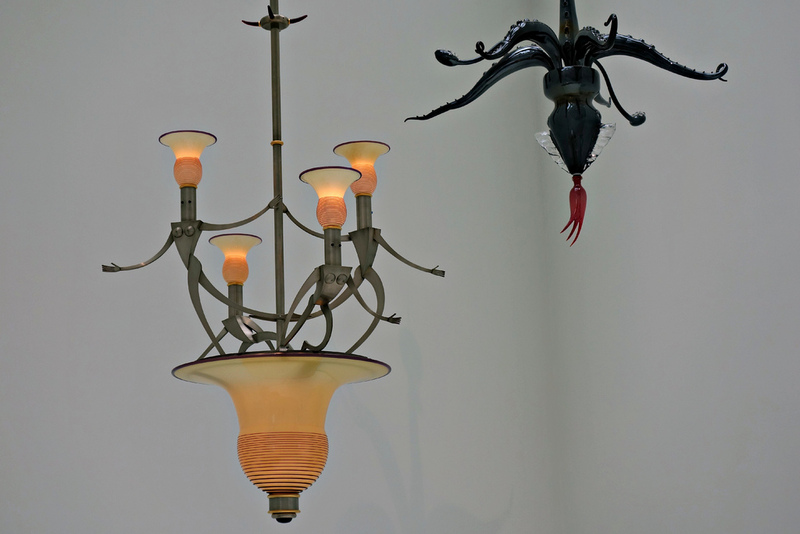 Around 30 haven’t been on view before, including Fred Wilson’s “To Die Upon a Kiss” (2011), in which inky color gradually fades down the delicate fixtures of a Murano glass chandelier, a reflection on the “slow ebb of life.” In a gallery for installations, Kiki Smith’s “Constellation” (1996) has a glass menagerie of animals by sculptor Pino Signoretto arranged on indigo-dyed Nepal paper according to a 19th-century celestial map. 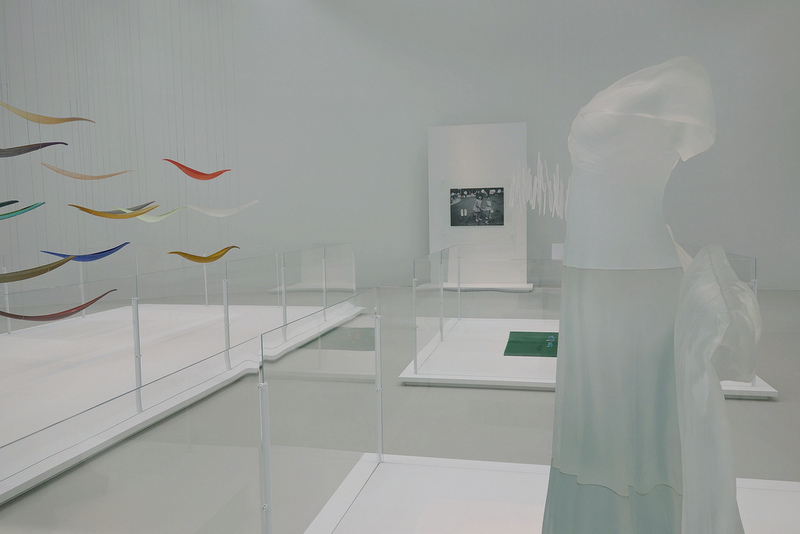 Previously, contemporary art was exhibited in a smaller museum space, which will continue to show earlier 20th-century work. 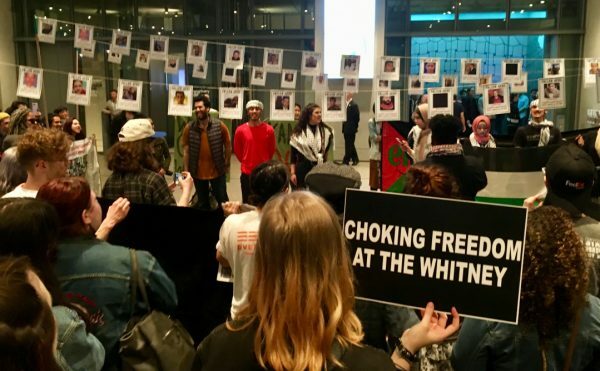 “Now we can welcome the artists who like to work big,” said Karol Wight, president and executive director of the museum. 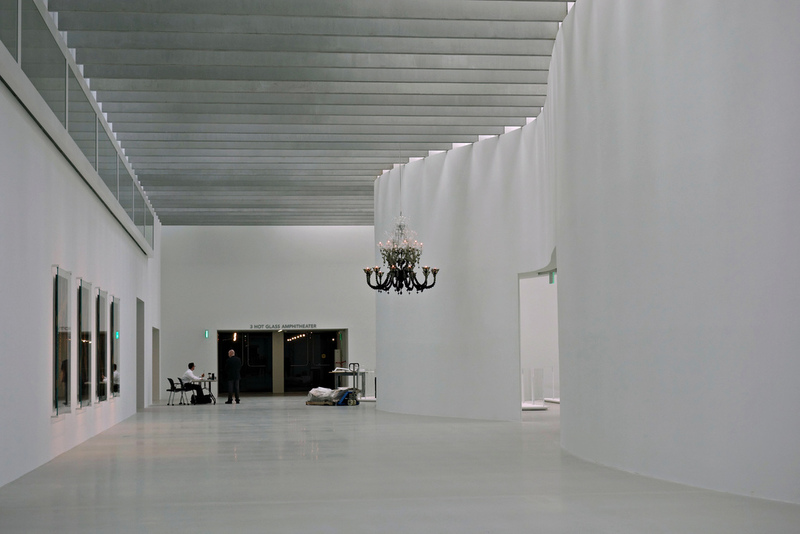 This applies not just to the soaring gallery space with its curving concrete walls that support a concrete slat ceiling; the adjoined Hot Shop will host both glass-making and other artists for residencies. 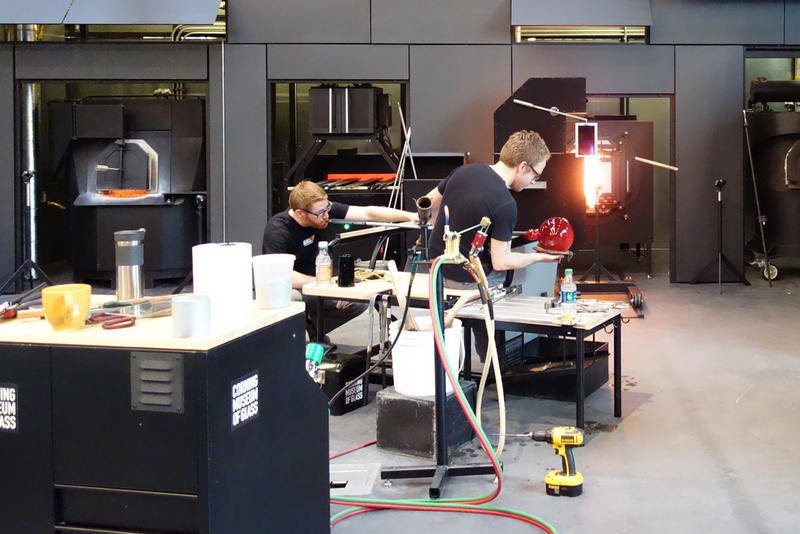 “We’re focused on it being a space where an artist could come in and making anything they want,” said Eric Meek, the Hot Glass supervisor. 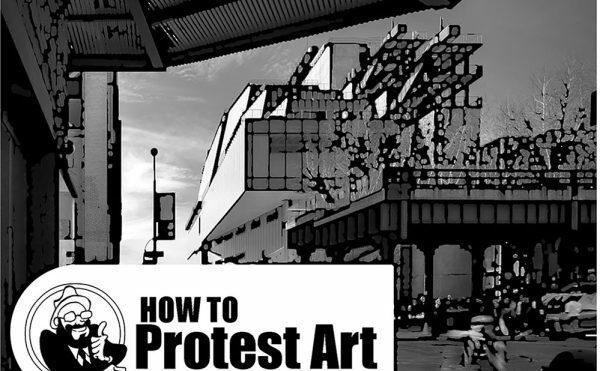 A 500-seat capacity will expand on live demonstrations already active in the museum. 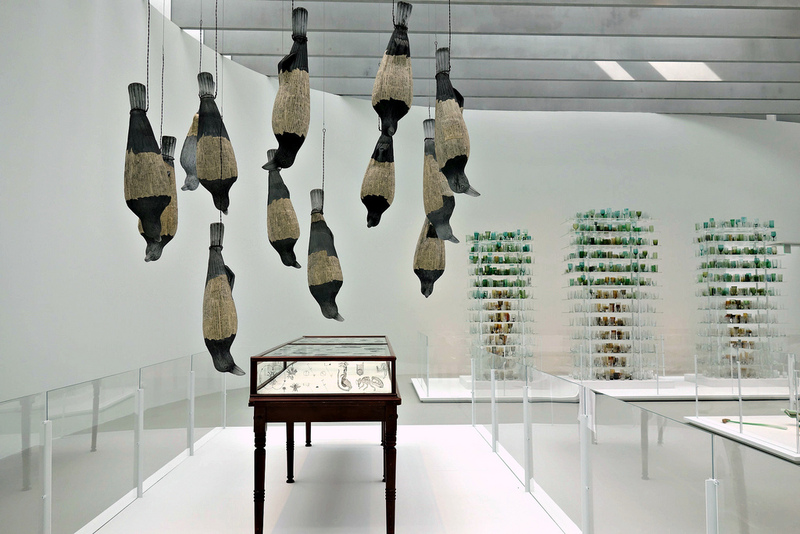 Opening weekend it will feature Steven and William Ladd working on a piece involving glass ants carrying glass bombs, all made on site. 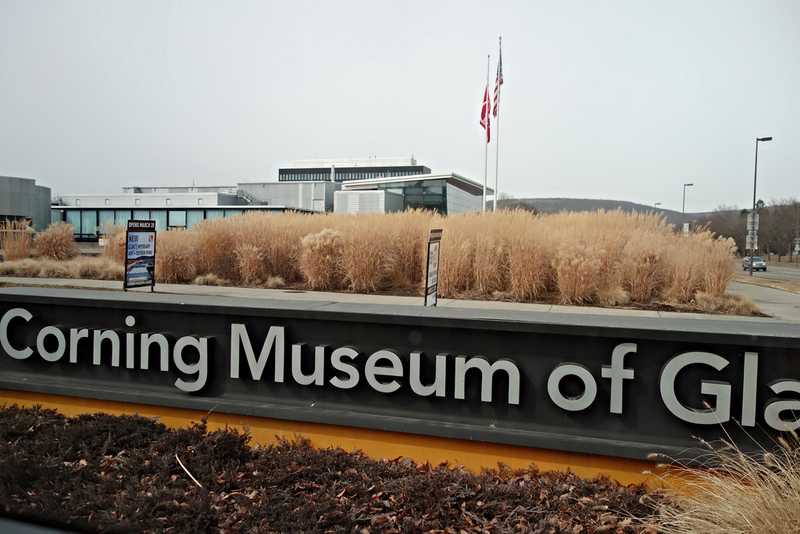 Since it opened in 1951, the Corning Museum has made strong architectural statements responding to the influence on glass of Corning Incorporated, which paid for the new $64 million expansion. Architect Wallace K. Harrison designed the original International-style structure with grids of glass blocks, then in 1980 Gunnar Birkerts contributed a curving rolled glass and steel addition, and in 2001 and 2012 Smith-Miller + Hawkinson added large-windowed expansions containing freestanding glass walls. 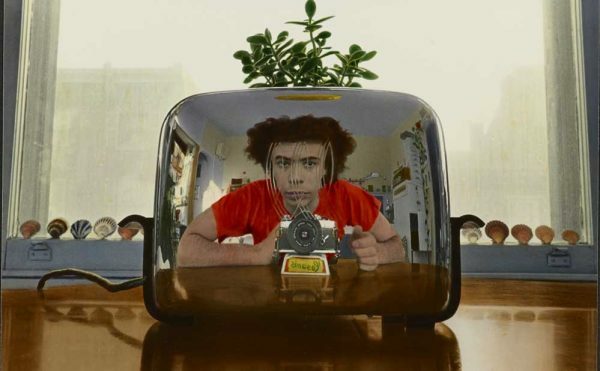 For his contribution, Phifer incorporated Corning’s Gorilla Glass, widely used for the screens of smartphones. 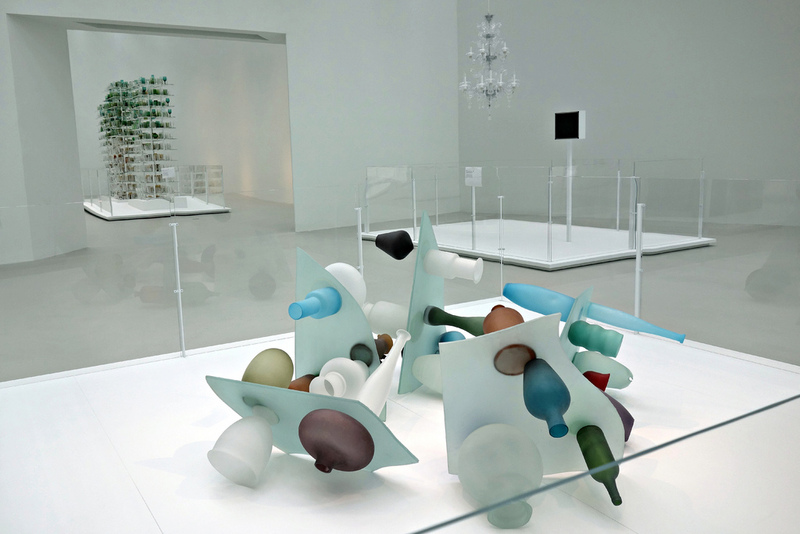 Phifer shaped the popular material into corrals for sculpture. 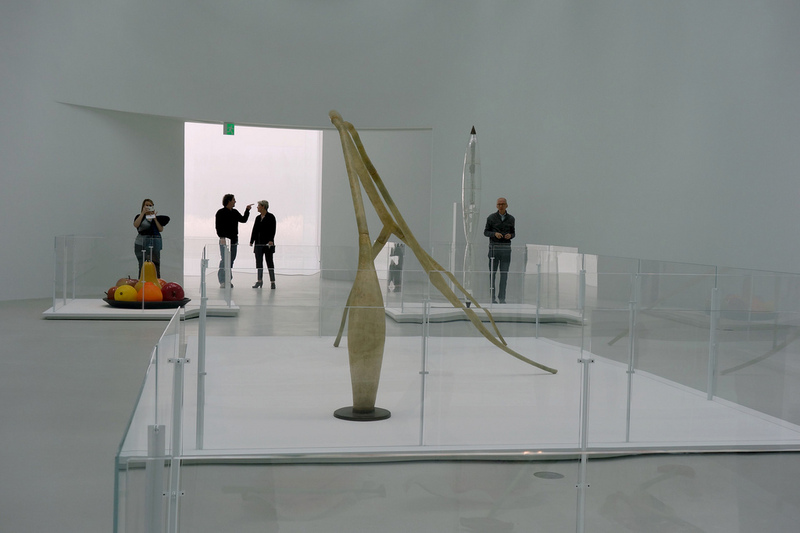 Clear and with little distortion, they give direct sight lines to the art, while allowing the family-friendly museum to welcome younger viewers without fear of a shattering collision. 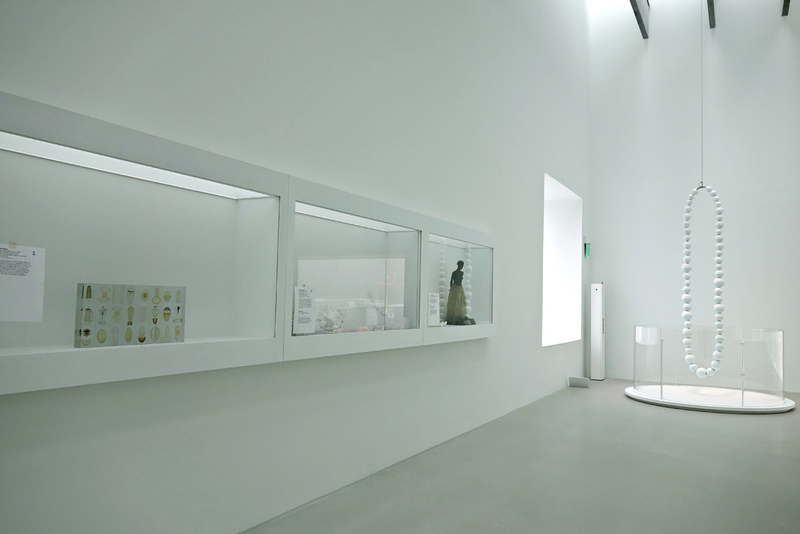 The carefully considered displays are essential to navigating the overwhelmingly white space, but it’s the use of natural light that encourages lingering. 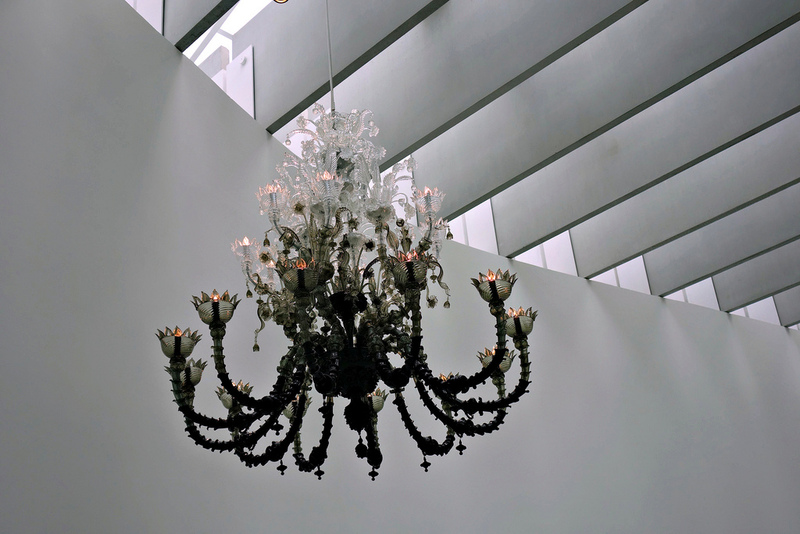 Glass, unlike other materials, doesn’t deteriorate due to exposure to light — in fact, it’s transformed by it. 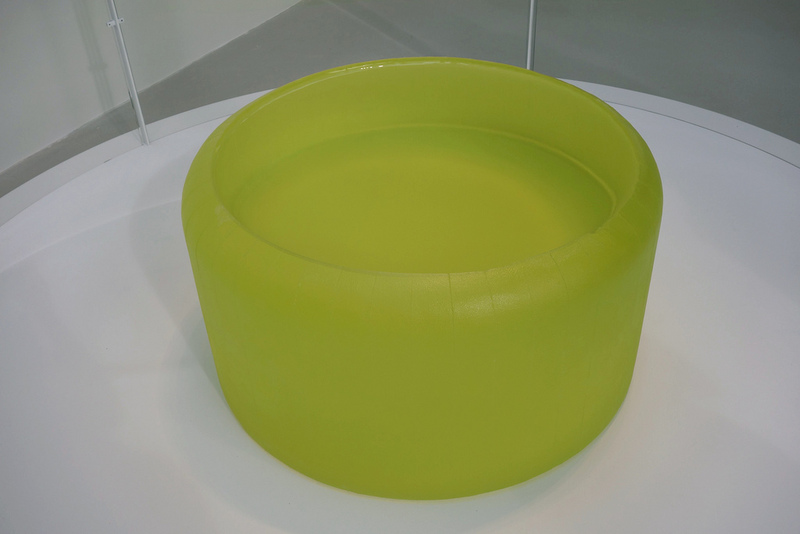 Positioned by one long window, Roni Horn’s “Untitled” (2013) is a 1,700-pound solid cast of green glass with a center oculus untouched by human hands; its tones will change with an overcast sky or a blaring, bright day. 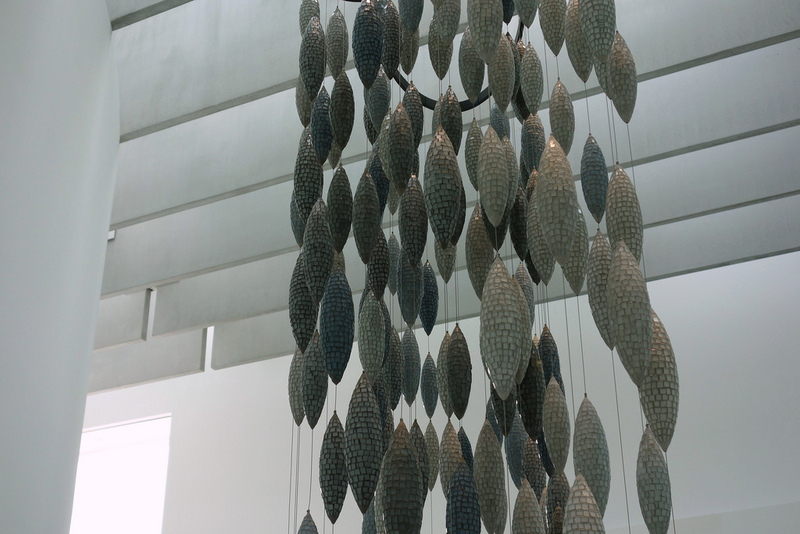 At the entrance of the wing, Ann Gardner’s “Fog” (2007) features over 100 hanging mosaic tear drops in an array of grayish hues like clouds. 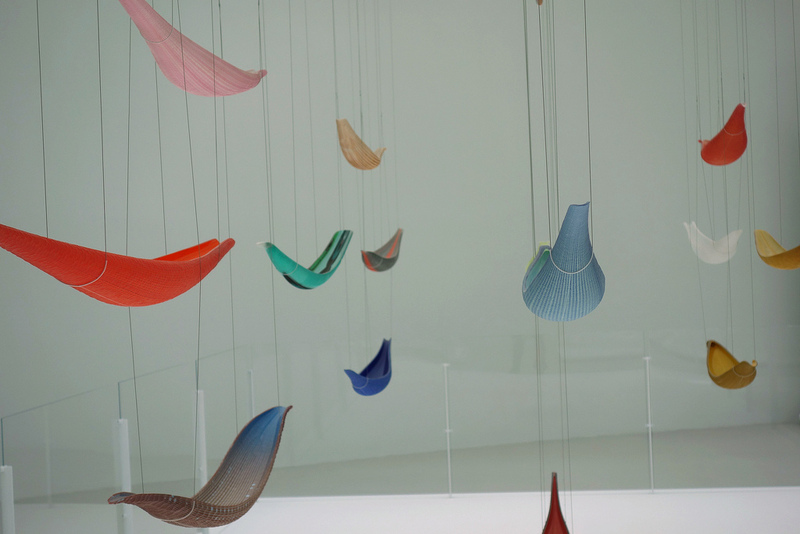 Each gallery opens in a large, angled portal onto the next, and whether it’s Lino Tagliapietra’s “Endeavor” (2004), with its flying flock of vibrantly colored Murano glass vessels, or Liza Lou’s “Continuous Mile” (2006–08), with its carefully stacked mile of beaded rope made in collaboration with a team of Zulu women, all the pieces have a dynamic interaction with the glowing light. 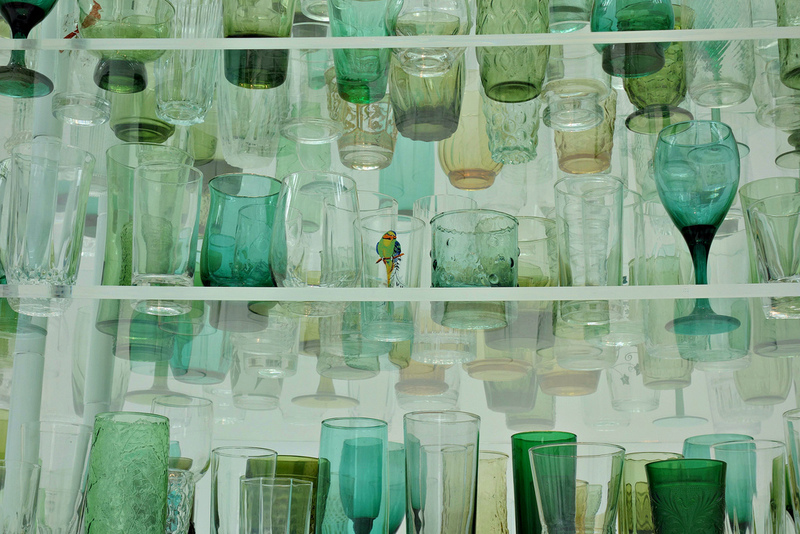 “We still don’t know everything glass can be,” said Tina Oldknow, senior curator of modern and contemporary glass. 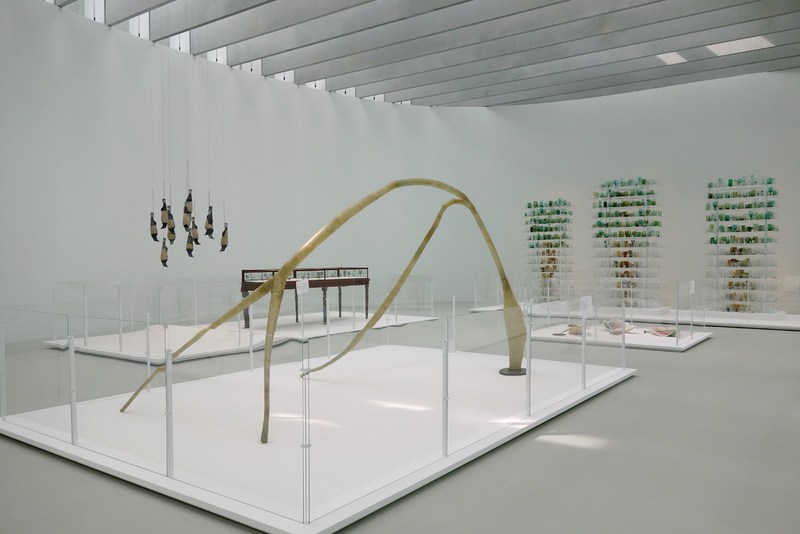 In the new wing the museum is celebrating what has been discovered of its lucent properties through artistic experimentation. 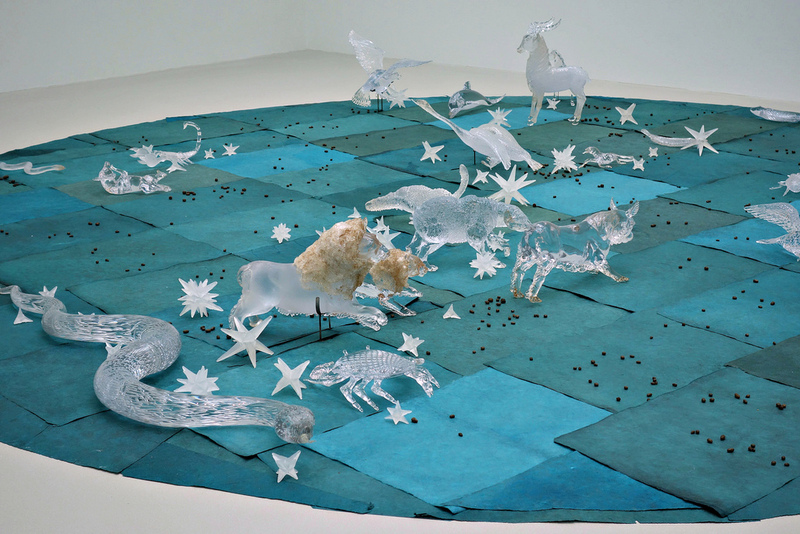 Detail of Katherine Gray, “Forest Glass” (2009), made of about 2,000 found machine-made drinking glasses. 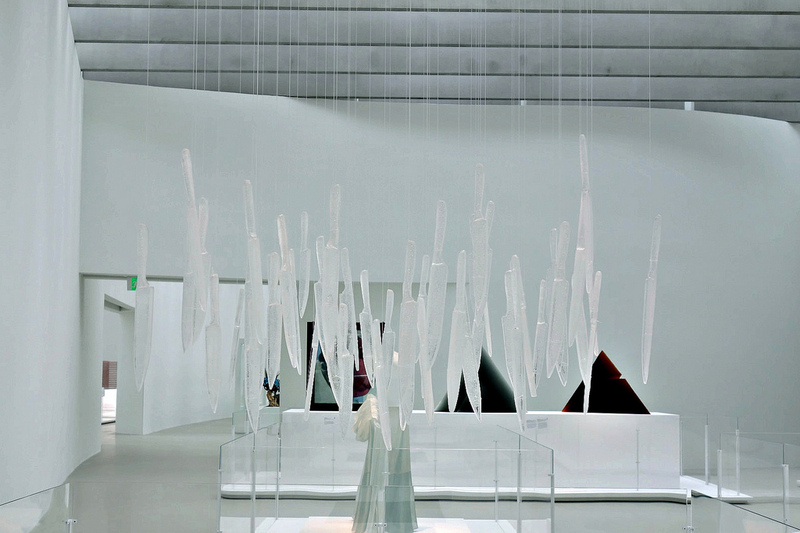 The piece is a response to the huge amount of wood used to fuel kilns for glassmaking. 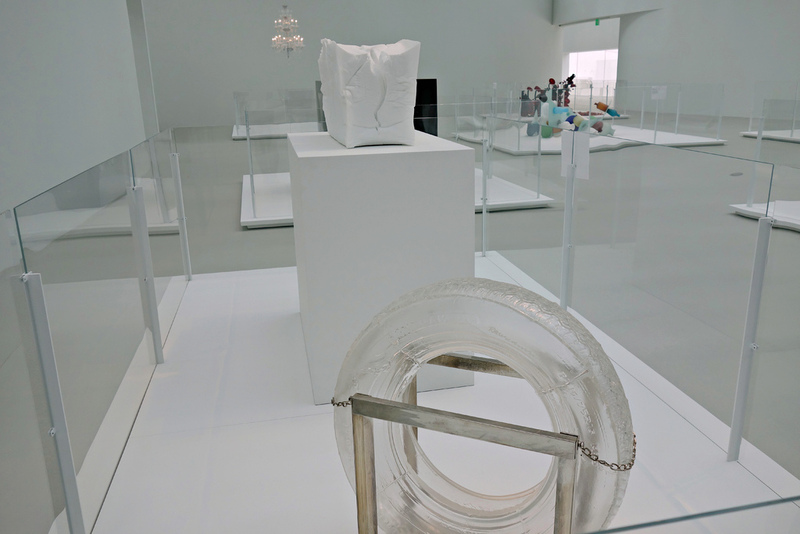 Installation view of Robert Rauschenberg, “Tire” (2005, designed 1995-96), made by creating a complex mold from a tire into which hot glass was blown with assistance of Daniel Spitzer and Dan Dailey. 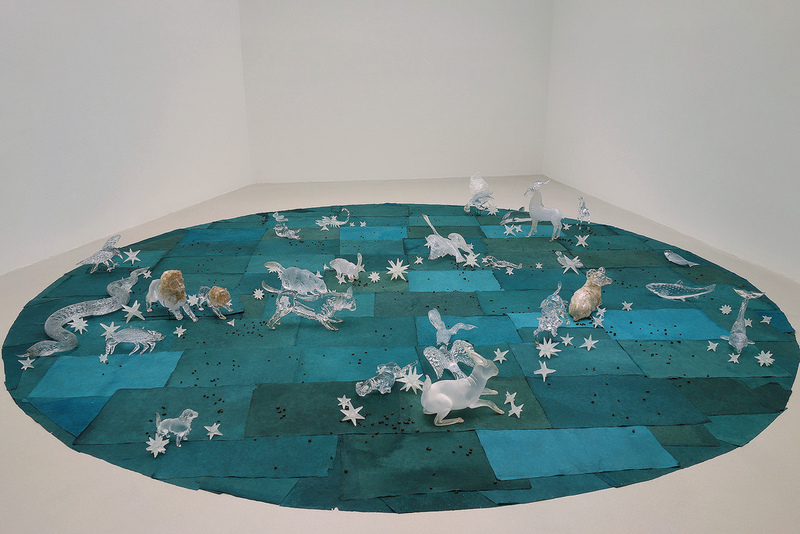 Liza Lou, “Continuous Mile” (2006-08), glass beads, cotton, thread, made over a year with a team of Zulu women in Durban, South Africa. 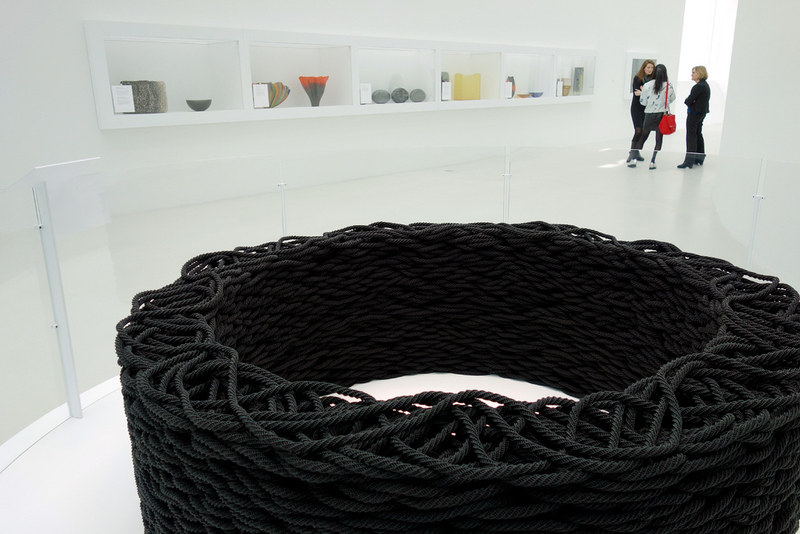 The stacked rope has 4.5 million beads and measures a mile in length. 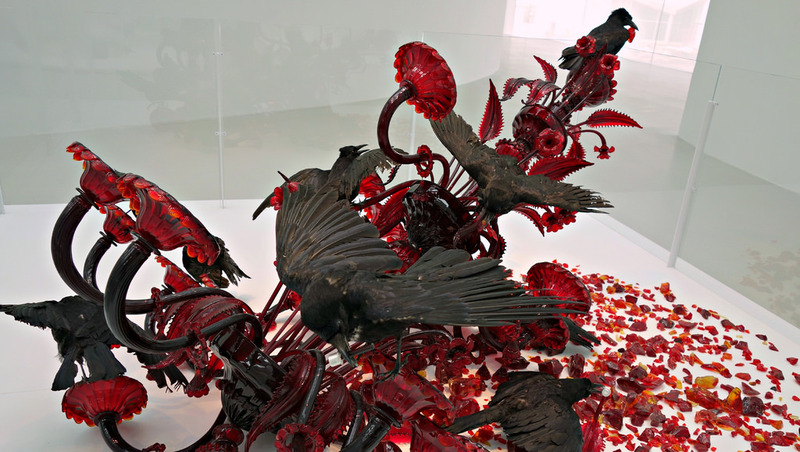 Detail of Javier Pérez, “Carroña (Carrion)” (2011), blown glass chandelier, assembled, broken; taxidermied crows, wire, monofilament. 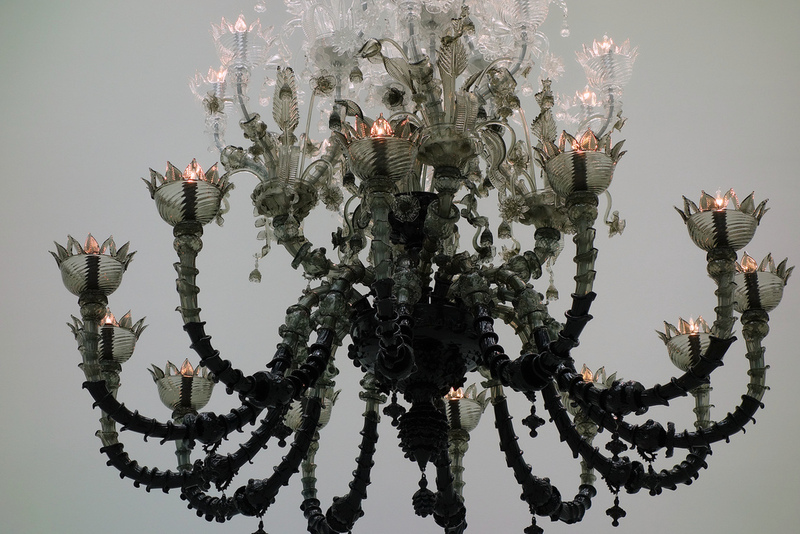 The artist had the blood-colored chandelier made and then purposefully broken, a comment on the fading of the glass industry in Murano. 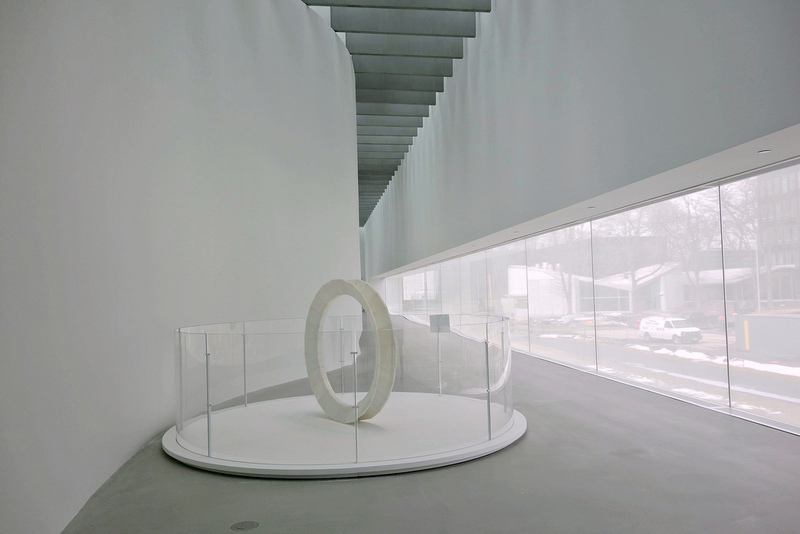 The Contemporary Art + Design Wing opens March 20 at the Corning Museum of Glass (1 Museum Way, Corning, New York).